Another encounter with the Library of Congress? The first one involved the Motown/Hip-O release of Heaven Must Have Sent You: The Holland/Dozier/Holland Story, a three-CD set which was Grammy-nominated in 2005. The award category was Best Album Notes, the writer of those (ahem) was yours truly. The result was announced on February 8, 2006, at the Staples Center in Los Angeles. Among the other nominees was David Ritz, whose distinctive prose was part of Pure Genius: The Complete Atlantic Recordings (1952-1959), an assembly of Ray Charles’ ground-breaking music. (As you know, David authored the definitive Marvin Gaye biography, Divided Soul.) The night before the Grammys, he hosted a small party at his Los Angeles home; we chatted, mingled with friends and acquaintances, and wondered about our chances. The following day, the winner in the Best Album Notes category was announced: Jelly Roll Morton – The Complete Library of Congress Recordings by Alan Lomax. At the Staples Center that Wednesday afternoon, David and I maintained our composure. The Morton package, featuring musicologist Lomax’s 1938 interviews with the jazz pioneer and liner notes by John Szwed, was unique. Members of the National Academy of Recording Arts and Sciences, the Grammy voters, had made clear their preference. So you can imagine my delight when the Library of Congress’ National Recording Registry asked me to write a guest essay about “My Girl.” That Temptations triumph is one of 25 recordings recently added to the Registry “for their cultural, historic and aesthetic importance to the American soundscape.” They are “aural treasures worthy of preservation,” noted Librarian of Congress Carla Hayden this past March, when she announced the 2017 inductees. In addition to “My Girl,” these included “Le Freak” by Chic, “(We’re Gonna) Rock Around The Clock” by Bill Haley and His Comets, “(I Left My Heart) In San Francisco” by Tony Bennett, “If I Didn’t Care” by the Ink Spots, “Alice’s Restaurant Massacree” by Arlo Guthrie, “The Gambler” by Kenny Rogers, “How I Got Over” by Clara Ward and the Ward Singers, and albums by Run-DMC (Raising Hell) and Fleetwood Mac (Rumours). The inducted works are chosen from online submissions by the public and from input by the National Recording Preservation Board, which is comprised of prominent figures in music, recorded sound and preservation. The “class of 2017” brings the total of registered titles to 500, part of the Library’s recorded-sound collection of nearly three million items. There are six Motown recordings, so far, among the 500. In addition to “My Girl,” they are “Where Did Our Love Go” (chosen for the 2015 registry), “The Tracks Of My Tears” (2007) and “Dancing In The Street” (2005), together with two albums, Songs In The Key of Life (2005) and What’s Going On (2003). Also present is post-Motown magic by Michael Jackson – his album, Thriller – and a recording of Dr. Martin Luther King’s “I Have A Dream.” An early version of the latter was heard in Detroit in June 1963; two months later, the civil rights leader delivered his historic speech in Washington, D.C. Both versions were subsequently released as albums by Motown. My account of the making of “My Girl” is here. 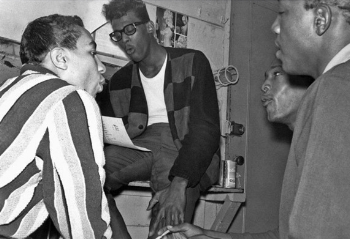 The facts are familiar to Motown aficionados, yet it was satisfying to identify – thanks to Showtime at the Apollo author Ted Fox – when it was in 1964 that Smokey taught the song to the Temptations. Ted told me that starting the week of Friday, October 2, 1964, the Miracles headlined a bill with the Temptations, Garnet Mimms, the Vibrations, Irma Thomas and comedian Jimmy Pelham. It was then and there, in an Apollo dressing room, that “My Girl” really began to take shape. “This annual celebration of recorded sound reminds us of our varied and remarkable American experience,” said Carla Hayden in March. So get nominating for the 2018 entries, and beyond. Contact your congressman, lobby your librarian. Your country – not to mention the men and women of Motown – needs you. Music notes: most of the recordings mentioned above are available digitally, save for the exact Holland/Dozier/Holland (well!) and Jelly Roll Morton packages. You may be able to locate physical copies of those somehow, someway.